The trip to Kapadokya with my family was fantastic! 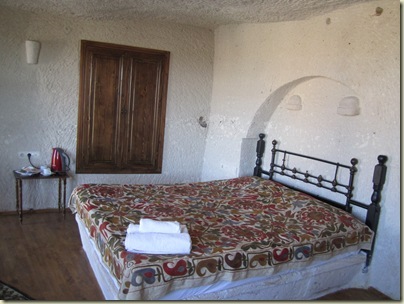 We stayed at an adorable little place in Goreme. The owner was incredible helpful. He steered us to some really wonderful small family owned restaurants where we had some truly incredible food. I even went back to one of them later and learned how to make Turkish Manti (ravioli). Showing my parents the incredible rock formations, with their amazing natural properties and unbelievable carvings and churches was really wonderful. I was so excited to share my favorite parts of my new country with my Famfam. 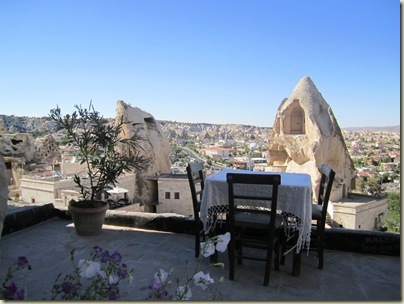 We stayed in a lovely hotel which had a great view of the valley of Goreme. We had two rooms on slightly different levels. 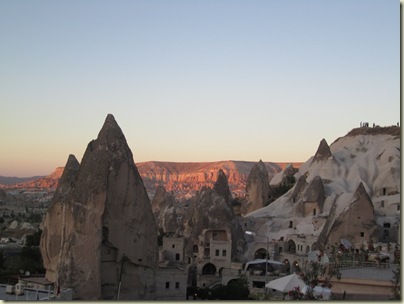 The rooms themselves were carved into the rock walls of the fairy chimneys. We shared a balcony which worked out very nicely for post hiking cocktails. My parents were game for all kinds of hiking and tromping. We climbed hills and rocks, looking for the best views. 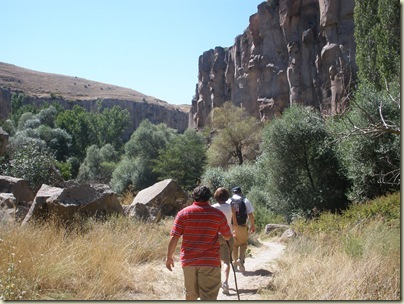 This visit to Kapadokya we actually had time to hike in Ihlara valley. 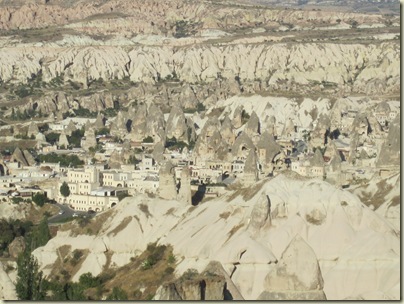 This is a valley about 45 minutes away from Goreme. 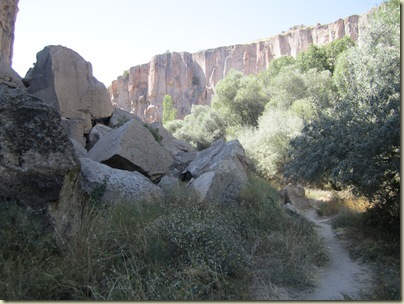 To enter the valley you have to climb down about 400 steps because the valley walls are made of sheer rock cliffs. Into these cliffs thousands of year ago people had carved large and elaborately decorated churches complete with vivid frescos. There are also many cave-dwellings carved into the rock as well. We hiked from the halfway down the valley to the end and saw several lovely churches and lots of cave dwellings. A stream ran through the middle of the valley separating the two sides. At the end of the valley we wanted to walk back on the other side to see different scenery but there was no bridge. 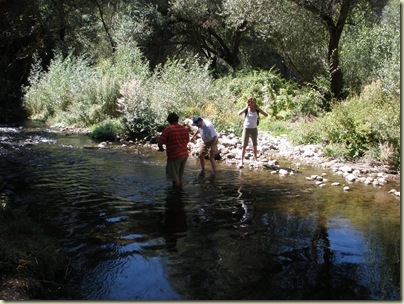 We intrepid explorers found a shallow spot to cross and trudged through. The effort to get to the other side was rewarded as the path was beautiful and there were several more churches on that side. 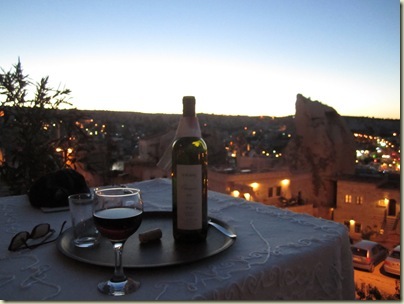 We also managed to visit a few wineries and take advantage of the regions other natural attractions. 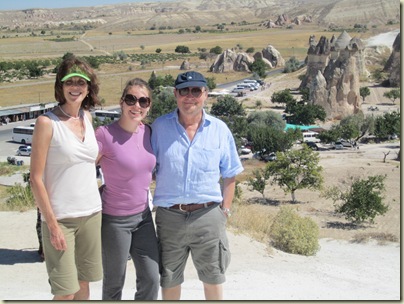 This entry was posted in Cappadocia, FamFam, Family, Goreme, Kapadokya, Parents, Turkey, Vacation, Wine and tagged Expat, Turkey by Jules. Bookmark the permalink. You will have to try your hand at Kayseri manti — you need little fingers for that! Hello to the folks!